My 4th collection of camera had arrived yesterday. The Superheadz had created this 110mm film toy camera (below) to a DIGITAL toy camera and still manage to keep the wash out look on the picture itself. Really impressed. The Digital Harinezumi still keep the original idea of using the frame as the viewfinder. Meaning you won't be able to see the outcome of the image from the LCD until you take the photos. You will be surprise to see a how different and nice it would be after taken it. 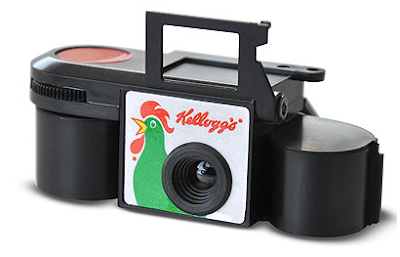 I guess this is the 1st vintage-lomo-effect camera that was created in digital. This is a very smart move. As you know, developing 120 film and 110 film is very expensive. 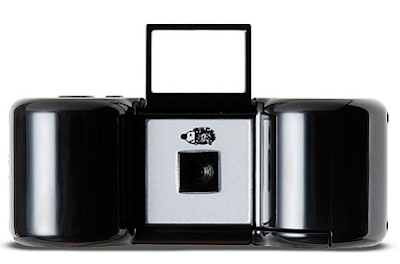 The 110 toy cam plus film can probably cost about 20 bucks. It is really a good price for a small and compact camera, but when it comes to developing the film.. it is another story. It cost about 20-30 bucks to develop just 1 roll of film. How expensive it that? I remember I had this camera at home when I was really really young. I don't know why somehow I remember I have used this camera before, when I don't even remember what I ate yesterday. I believe my brother or my sister had forgotten about this camera. I just realised that my parents actually owned the polaroid and 110mm film cameras before when I was a child but I don't know where it had gone to, or else I could have owned all these antiques camera now!! I have taken a few photos and a video using the Harinezumi. I am very pleased with the result. These photos were taken indoor with ISO 100. I haven't try on ISO 800 yet cuz I can't wait to post it up on my blog! With just 2mp, the quality is way out of my expectation. Below were taken outside the house. and this video taken by Harinezumi camera. Quality of the video is excellent even without the sound! I think Digital Harinezumi is a really a great toy camera. If you are really interested in buying this camera, you can go to ebay or to Four Corner Store to purchase the camera. I will suggest to buy from Four Corner Store as it is cheaper and there are a lot of lomos and vintage looking cameras on sale! Digital Harinezumi is currently out of stock in Four Corner Store. They will restock really soon. Probably 1 week or so. So be patient :) Oh! remember to buy the micro SD card from them as well! Or else you won't be able to use it when you get your camera. Here are the Specs for Harinezumi if you are interested. Thanks for the link! We now have plenty in stock, as well as SD cards and batteries. Enjoy you new camera! No problem Nic! My pleasure!